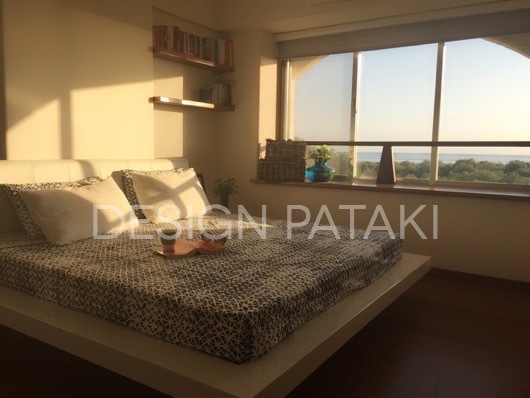 A quaint oasis amidst the madness of city life is the best way to describe this lovely apartment situated in Andheri. The mangroves surrounding the home, make you forget that you are still in Bombay. 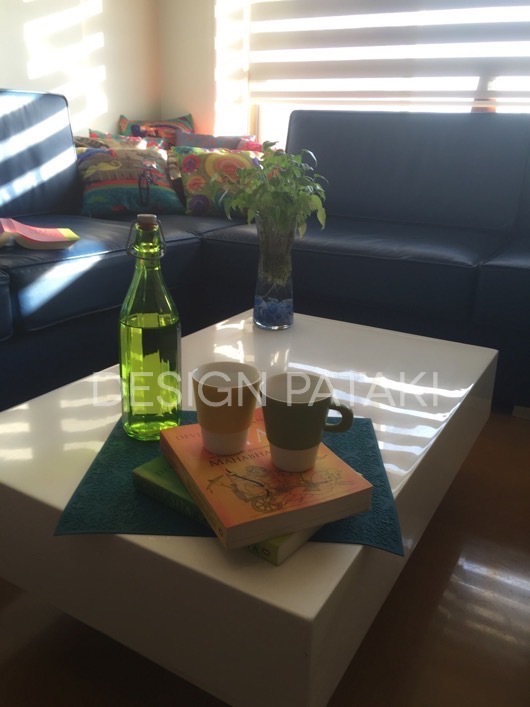 The house has been designed by Sameer Raut of Studio 8:23, for a young couple recently moved to the city. 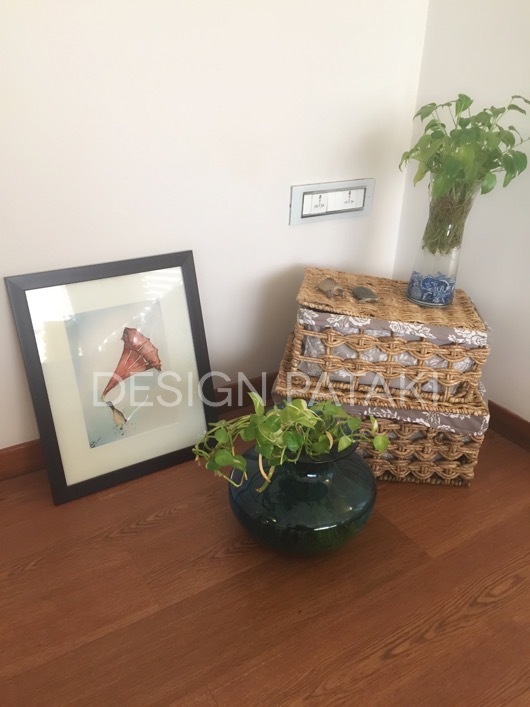 The client brief was very simple, a Mediterranean look to perfectly with their vibe and lifestyle. Hence giving the house a very fresh and open feel. A predominantly white colour scheme, interspersed with accents of blue, green and yellow flow through the entire apartment creating an atmosphere of peace and tranquility. The interesting play of colors keeps the atmosphere crisp, bright and cheery. 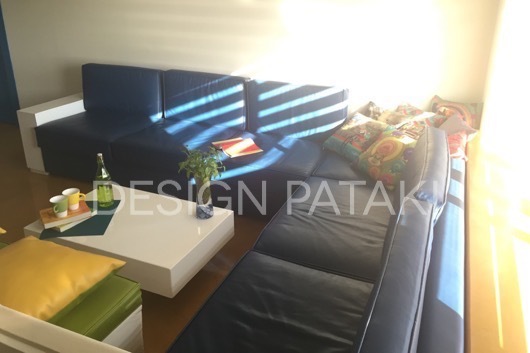 The blue couch in the living area with the kitschy cushions casual strewn in the corner makes for a cozy place to hang out with your friends, or sip on your morning coffee. 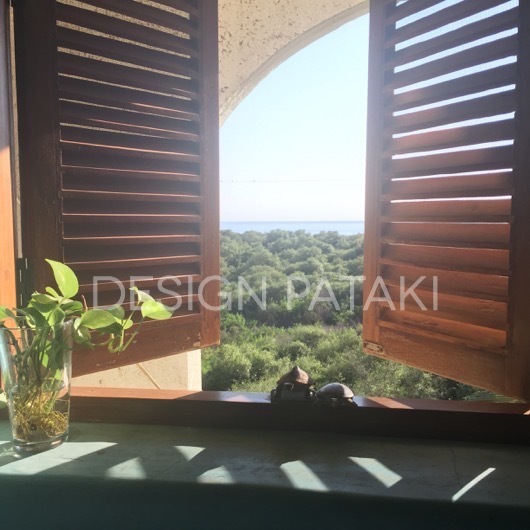 The master bedroom too boasts of a beautiful window ledge where one can sit to enjoy the beautiful panoramic view it offers. The striped blinds in both rooms look fabulous when allowed to let partial light in. Following a similar theme the guest bedroom is also decorated in a simple manner with an exposed white brick bed base, adding character. 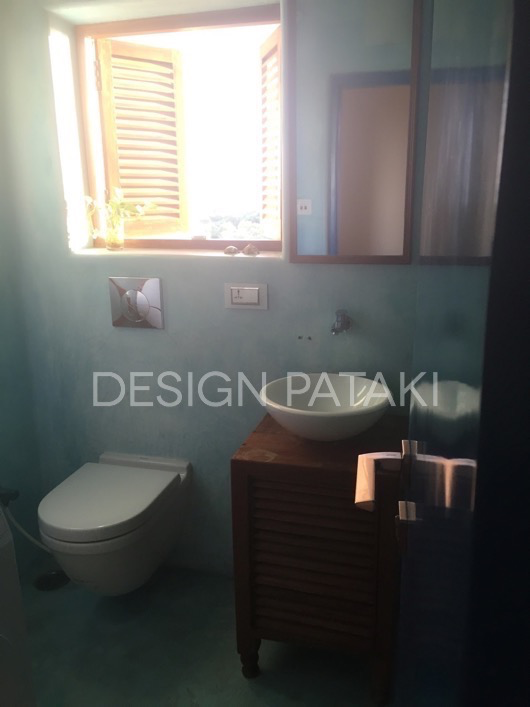 The bathrooms have been done up in a very Grecian using the colour and unfinished texture its known for. Hence the blue distressed walls, the little wooden louvered windows that match the washbasin cabinet and the pretty tiles in the shower area make for a cute space. We absolutely love the attention to detail. While one room has a blue door the other one has a yellow door. The balance between white and colour couldn’t be more perfect. Even though the space feels open it has a very cozy vibe to it. It’s like being lost in a whimsical world. All the natural light streaming in through the large windows throughout is the icing on the cake and the picturesque view of endless green foliage, such a rarity in our city is the cherry on the icing. This house definitely makes it to our list of in city holiday home houses. We’ve used the New Asus ZenUI for the pictures. The nice guys over at Asus, sent over the phone for us to try out. It was simple and easy to use. Other than the benefit of the fact that it tells you the aperture and exposure of each shot, one really useful feature is that you can edit the curves on the phone itself. When shooting interior shots, lighting is always a problem. Hence most pictures go through photoshop to correct the curves. With this features you can directly adjust the curves. Try their filters and collage options, there are so many! Tag us in pictures using #MyAsusZenFone if you’ve clicked any pictures with this phone. We would love to share them!